Frost-hardy, rhizomatous, bearded iris with sometimes evergreen, grey-green leaves and branched stems with 2-6 large, scented, soft blue flowers, with yellow beards. To 1.2m. [RHSE, Hortus]. ‘Iris pallida odorata ‘is a fine species, of robust habit, attaining the height of from two to three feet, with broad, sword-shaped leaves and remarkably large and conspicuous broad-petalled porcelain-blue blossoms, from four to six inches in diameter, the lower sepals having a very beautifully bearded crest along the central disk, coloured with rich orange towards the extremities, and margined with pale-green streaks. The flowers often being borne on successive tiers or clusters upon elevated flower scapes, produce a stately and elegant effect.’ [The Gardeners Chronicle', 1854]. ‘It had been always a matter of surprise to us that so apparently distinct a species as the present, so well known to all former Botanists, and so long cultivated in all the gardens of Europe, should have escaped the notice of Linnaeus, while he distinguished as species his supposed sambucina and squalens, to appearance scarcely worthy of being remarked as varieties; until upon critically reviewing the whole of his species, we found found that the squalens had been mistaken by Jaquin for the sambucina, that other Botanists had confidentially [sic] followed him in the error, and that the present plant was the Linnean sambucina; but as this name is now so generally attached to Jacquin’s plant by the excellent figure of Curtis and the authority of the Hortus Kewensis, we think it more advisable to let it remain; adopting Lamarck’s [Iris pallida] for the present species, and expunging squalens, as being a mere variety of the now sambucina; although in truth the names of Linnaeus were still better adapted to the plants he had destined them for. The synonym of Jacquin quoted by the authors of Hort. Kew. for their squalens should be restored to Iris variegata. […] Received by Clusius from Constantinople, but is, we have no doubt, also a native of the southernmost parts of Europe. Cultivated by Gerarde. Is known in all the nurseries about town by the name of the Dalmation Iris. More tender than germanica or florentina, being in some situations destroyed by a very severe Winter succeeded by a wet Spring.’ [BM t.685/1803]. Listed in all published catalogues [B.248/1843]. Iris pallida Ten. 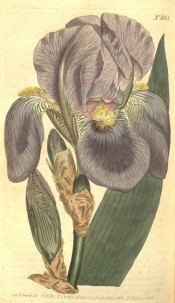 (1824-29) = Iris germanica L. florentina which see. Iris pallida Salisb. (1796) = Iris spuria L. ssp. halophila (Pall.) B.Mathew & Wendelbo. which see.